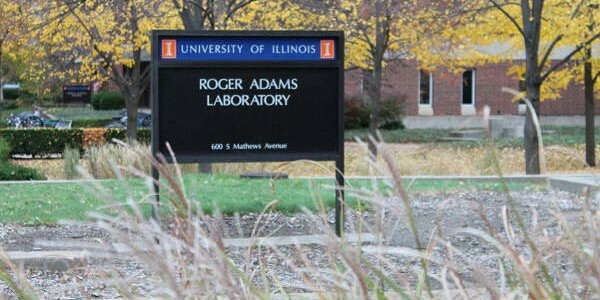 The Shukla Group is located in the department of chemical and biomolecular engineering at University of Illinois, Urbana-Champaign. The Shukla group is focused on developing and using novel atomistic simulation approaches for understanding complex biological processes. 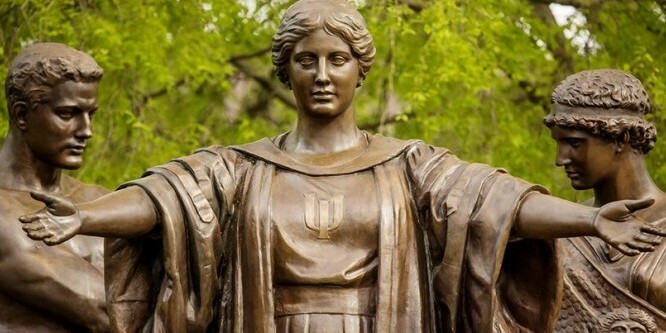 The key areas of current interest include understanding behavior of key cellular signaling proteins involved in cancer for drug design & development, stress and energy signaling enzymes in plants etc. If you are interested in learning more about our research and available positions, please contact us! 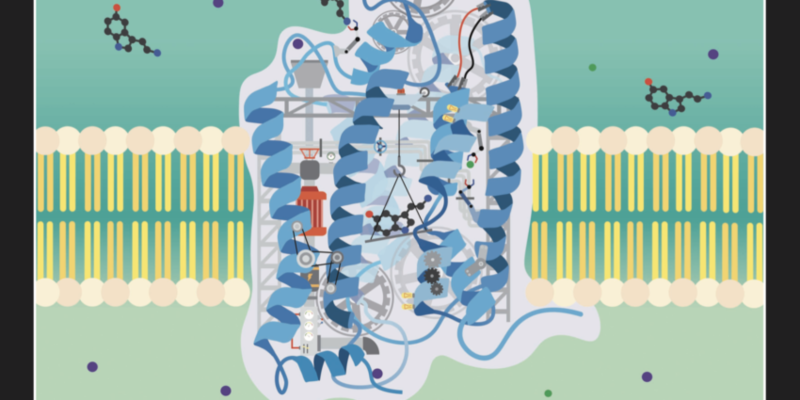 Cover article on Sodium binding to GPCRs published in Angewandte Chemie! Shukla Group Photo, February, 2019. Professor Diwakar Shukla (center), director of the ChBE GAMES camp, interacts with two students doing an activity about using enzymes to clean. 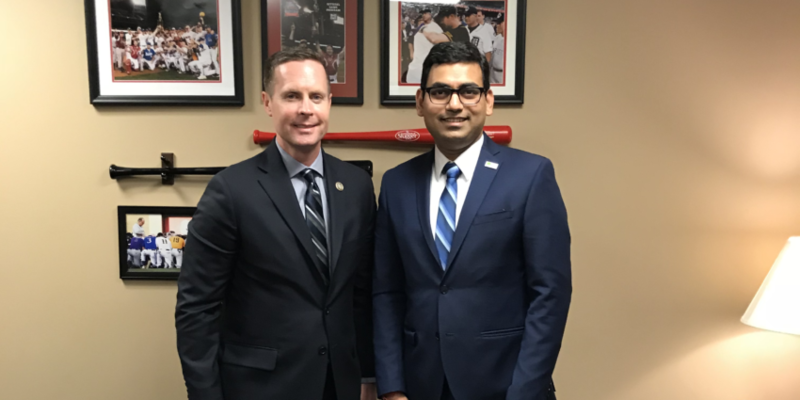 Prof. Shukla met with our congressman Rodney Davis (IL-13) to talk about our research on improving nitrogen use efficiency in plants. Jiangyan Feng, First Prize, ChBE Graduate Research Symposium, 2018. Molecular Machinery, Matthew Chan, 2019. 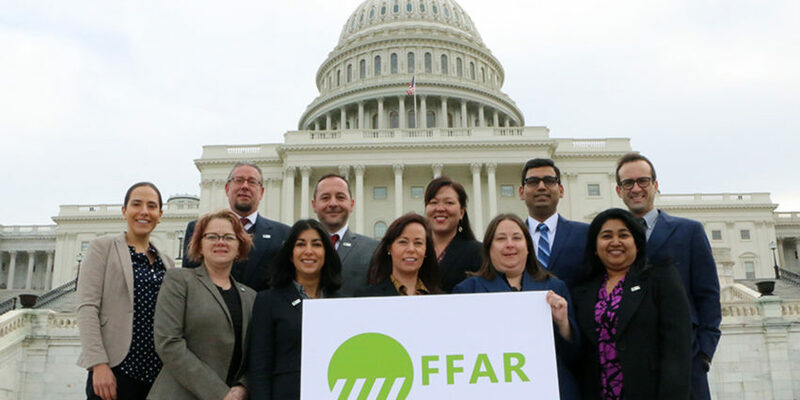 Our group received the New Innovator award in Food and Agriculture Research, Dec 2017. Zahra Shamsi, Second Prize, ACM Student Research Competition, 2019. January 2018: Jiangyan Feng received the Hanratty Travel Award from the Department of Chemical & Biomolecular Engineering at Illinois. Congratulations Jiangyan! November 2018: Chuankai Zhao gave a seminar on understanding molecular mechanisms of drought resistance in plants in the Photosynthesis Research Unit seminar series on campus. Congratulations Chuankai! 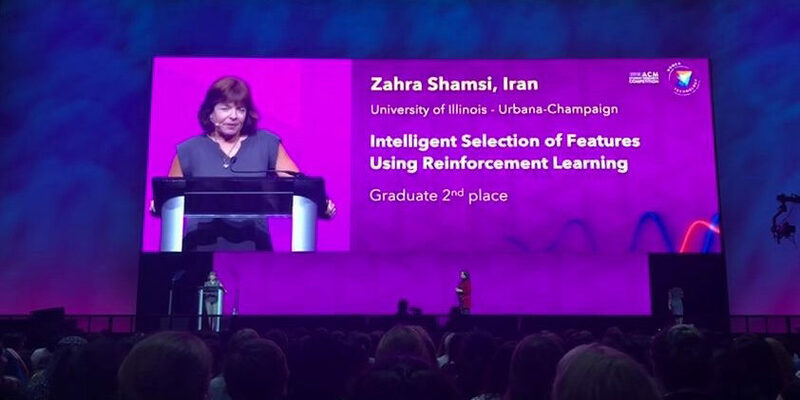 October 2018: Zahra Shamsi won the second prize in the ACM students research competition at the GraceHooper Celebration organized by AnitaB.org. Congratulations Zahra! October 2018: Soumajit Dutta, first year chemical & bimolecular engineering student joined our group. Welcome Soumajit! August 2018: Chuankai Zhao received the 3M fellowship from ChBE department. Congratulations Chuankai! 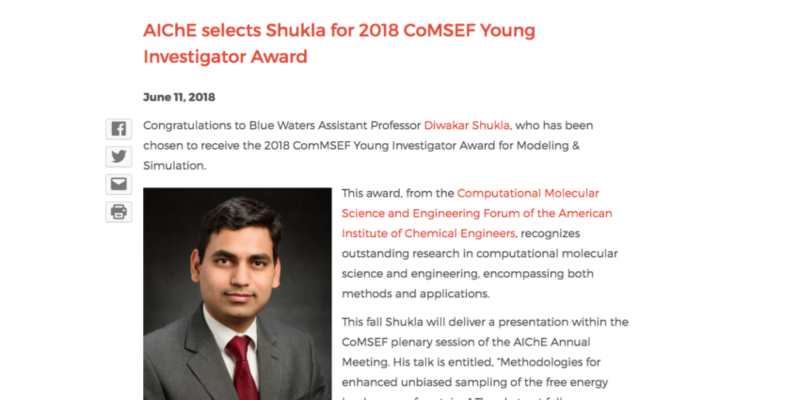 June 2018: Prof. Shukla received the CoMSEF young investigator award from American Institute of Chemical Engineers! Read the news here. January 2018: Soumajit Dutta passed the Chemical & Biomolecular Engineering PhD qualifying exam with flying colors! Congratulations Soumajit! November 2018: Matthew Chan was one of the finalists of the SCS Science Image Challenge organized by School of Chemical Sciences. Congratulations Matt! 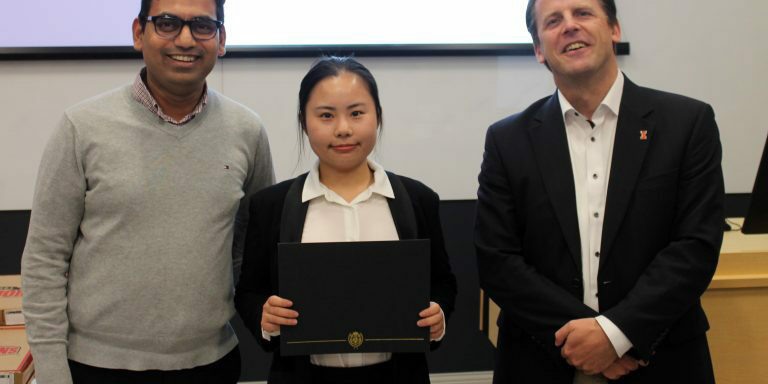 October 2018: Jiangyan Feng won the first prize in the ChBE graduate student research symposium. Congratulations Jiangyan! October 2018: Shriyaa Mittal passed the Biophysics Preliminary Exam with flying colors. Congratulations Shriyaa! August 2018: Matthew Chan and Jiming Chen passed the ChBE oral qualifying exam. Congratulations Matt and Jiming! May 2018: Jiming Chen was selected to receive the NIH Chemistry-Biology Interface Training fellowship. Congratulations Jiming! November 2018: Prof. Shukla received the NSF Early Career Award from the Division of Molecular & Cellular Biosciences at National Science Foundation! Read the news here. November 2018: Shriyaa Mittal received the graduate student travel award from the Biophysical Society to attend their 2019 annual meeting at Baltimore. Congratulations Shriyaa! October 2018: Chuankai Zhao received the Hanratty travel award from Chemical & Biomolecular Engineering department to attend ACS Fall meeting. Congratulations Chuankai! 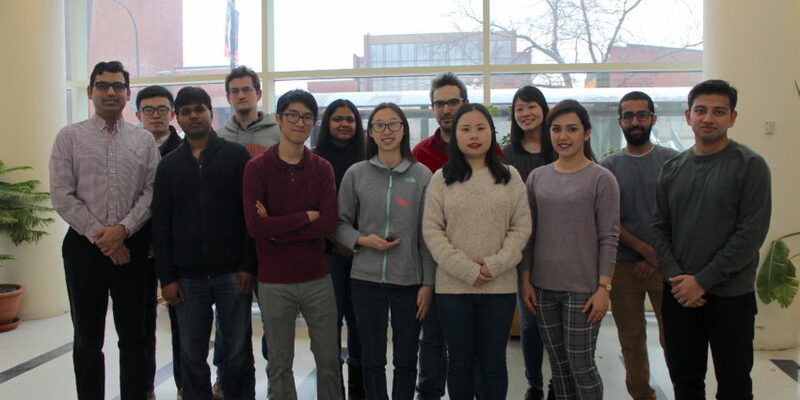 August 2018: Zahra Shamsi and Chuankai Zhao won the best poster awards at the 2018 Biophysics research symposium. Congratulations Zahra and Chuankai! July 2018: Chuankai Zhao passed the ChBE preliminary examination with flying colors. Congratulations Chuankai! 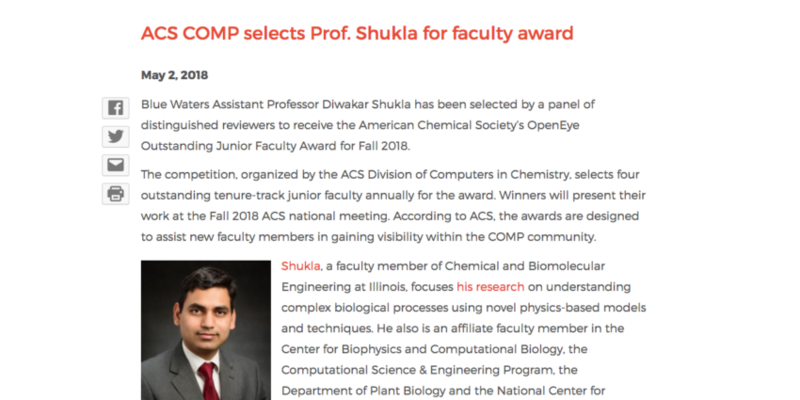 May 2018: Prof. Shukla received the OpenEye Outstanding Junior Faculty Award in Computational Chemistry from the ACS Division of Computers in Chemistry. Read the full news here.